Traveling to cities with vast public transportation networks can be an exciting experience, that is, until rush hour comes and all the subways and bus stops are filled with a mass number of people. You may also like service receipt examples. Renting a car at the last minute seems impractical, and taking a ride-sharing vehicle seems almost impossible to find at a reasonable price considering the crowded streets of commuters, so you’re left with the one option that’s fairly convenient than the rest: a taxi. You may also see hotel receipt examples. Taxicabs are designed to accommodate around four passengers at a time, which is perfect for when you and your friends need to get to a venue on time without breaking the bank. However, there have been numerous reports of taxi drivers charging passengers, especially tourists and foreign travelers, a lot more than the average fare. To prevent these incidents from happening, lawmakers have required taxi drivers to provide official receipts for their passengers. 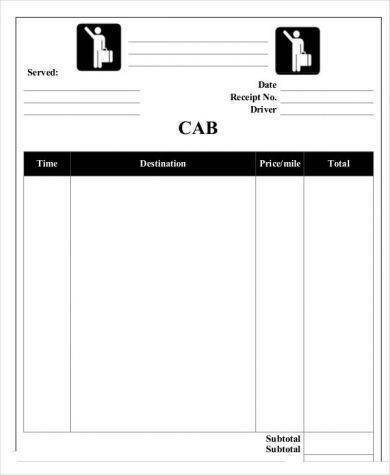 These taxi receipts are issued for the benefit and use of both the taxi driver and their respective passengers. People who go on business trips to a foreign land are usually offered a reimbursement on their transportation expenses. In some countries, this is either compensated by the company the individual is working for or by the local government itself. You may also see work receipt examples. The cost of taking a taxi for business purposes is typically tax deductible, with only a few exceptions to the case. 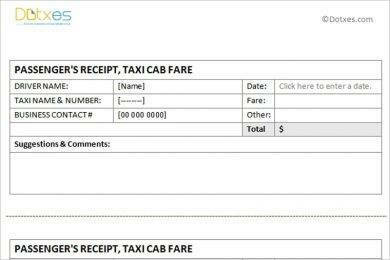 But in order to write off the cost of taxi fare, passengers are required to present a receipt for the expenditure. Taxi fares can only be claimed as a tax deduction under a few conditions. Say for example, your car breaks down in the middle of the road, so you’re forced to take a taxi to get to the office on time for a regular workday. Though your reason for taking a taxi may be classified as a business purpose, commuting expenses are not tax deductible, even if they are occasional and are not reimbursed. You may also like transfer receipt examples. But if you take a taxi from your office to the airport to pick up an important client, and use your own pocket money to pay for the fare in which you aren’t reimbursed by your employer, then the expense is considered deductible. It’s best to ask for a general receipt as soon as you get into the vehicle. Though the receipt would not be issued until you have reached your destination, it’s always a good idea to inform the driver beforehand. Tips may still be added even if you ask for a receipt. If the receipt is issued digitally but does not list your tip amount, you could always include a note at the bottom to indicate the tip. 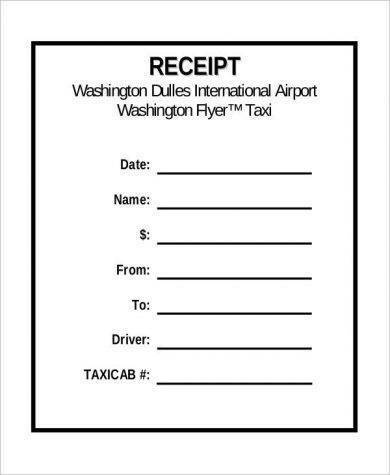 Some drivers even provide a blank receipt to fill out yourself, so when this happens, remember to write your exact fare and tip amount on the designated spaces and have the taxi driver sign it for authentication. Though handwritten receipts are often deemed suspicious by most companies, including signature will help validate the document. The Internal Revenue Service (IRS) usually requires taxpayers to provide valid documents showing business-related tax deductions, which includes expenses for taxi fare. The best form of documentation for this is an original receipt of the transaction that contains notations describing the business purpose. While you do have the option to receive or refuse for a receipt, taxis that accept credit cards as payment are obliged to issue a paper and electronic record of the transaction. When this happens, you must keep the receipt for when your credit card bill arrives. Though the IRS does not require taxpayers to follow a specific method of record keeping, most experts suggest keeping a log book or expense diary to organize these documents. 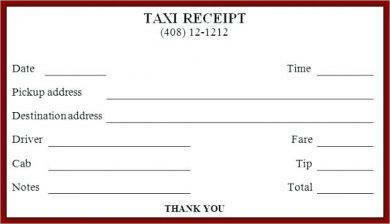 However, it’s important to take note that a physical taxi receipt may not be required for expenses that are less than $75. Along with a business-related function, you can deduct the cost of taking a taxi for the reason of obtaining medical care as well. This includes taxi fare for yourself and another person, especially if you aren’t allowed to travel without a companion. You may also see sales receipt examples. This may also be done when a parent or guardian needs to accompany a sick child to the clinic or hospital. But you can only claim the deduction if you itemize and include the taxi fare with other medical or dental expenses. Apart from that, the same documentation rules still apply, where a physical receipt must be presented for fares that are $75 or more. You may also like receipt voucher examples. Within the past year, you’ve probably accumulated a 10-inch stack of official receipts from various retail stores, restaurants, supermarkets, online shops, and transportation networks. But have you ever wondered why these simple receipts are even issued in the first place? We’re usually offered a receipt after paying for something. While some people tend to throw it away in the nearest trash can, others like to keep it in their bags or wallets until they’re no longer valuable. Most people keep their basic receipts for documentation purposes, especially when they want to keep track of their expenses for their monthly budget. This is a good practice, especially if you tend to spend more than you can actually afford due to impulsive buying decisions, or when making major expenses for something as huge as a personal vehicle or a major home improvement. If so, store these recipients in special folders as they come in handy for future reference. Most businesses also encourage their customers to keep their receipts to prove that they already purchased the item from the store. This can also be useful if you want to return a damaged or defective item to the store within its warranty date, or have it exchanged for something different. You may also see cash receipt examples. Some warranties can last from 14 days up to 2 years, so until that warranty has passed, you might want to hold on to the receipt to make the most out of its privileges. As a business owner, keeping these formal receipts is also important for several reasons. For one, keeping the receipts issued to customers and the receipts received from other businesses is one of your best defenses in an audit. This way, you can track any additional expenses that may have been overlooked by your accounting department. Keep in mind that your accounting records may be incomplete and unreliable without an official receipt. These records will assist you in monitoring the progress of your business, identifying sources of income, tracking deductible expenses, and preparing tax returns. You may also see company receipt examples. Now, imagine if a customer came into your store asking to return an item that they claim they bought a few days ago in exchange for something new. You know that the store sells the same type of item the customer is carrying, but how will you know if the customer did purchase that item from your store? Without a physical document to support the transaction, how will you know if the customer’s claims are true? You may also like tax receipt examples. As mentioned before, it’s important to secure a receipt for the customer and the business to benefit from. Even if the customer refuses, your business should still have a copy for future reference. The standard receipt serves as hard evidence to support the existence of a recorded transaction, which is another reason why you should not discard your receipts even after you have filed for your tax return. It’s highly advisable to keep these receipts for three years from the date your tax return had been filed. It may sound like a lot of paper to dig through, but dealing with these stacks of documents sounds a lot better than settling a case with the IRS. Fortunately, with the advent of technology, you can manage these documents digitally using a specially designed software. This ensures that your receipts are kept safe and sound from natural disasters such as fire, flood, and any other unforeseen events. You may also check out delivery receipt examples. You can simply have the receipt scanned or photographed, and then uploaded straight to a cloud-based system. Notes may also be added along with the receipt to inform you exactly what it was issued for. 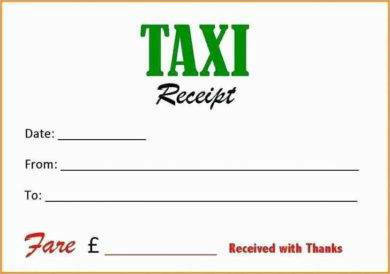 Do I Need a Taxi Receipt? 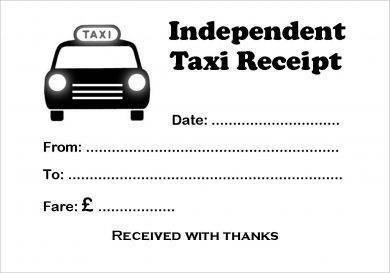 It’s not common for passengers to ask for a receipt or for taxi drivers to even provide one, but it’s not unusual either. Some countries have implemented laws that require taxi drivers to provide their passengers with a generic receipt after every ride, but most passengers refuse to accept one because they don’t know what to do with it. A service receipt simply functions as an official bill of sale. This is used to document a legal transaction of a good or service for an agreed amount of money between a customer and a retailer or a service provider. This is often used for legal and tax purposes, especially if a city’s local transportation agency requires all registered taxi operators to issue one. This may also come in handy for travel reimbursement, especially for employees who are sent on business trips on foreign soils. This way, work expenses covered by personal funds may be reimbursed accordingly. 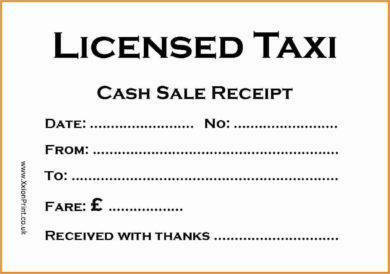 Even if your local taxicabs follow a meter or a standard service rate to charge passengers, you still have the right to request for a receipt for your own use. 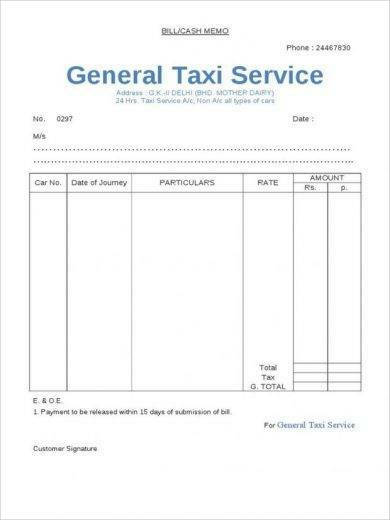 The basic receipt should contain information on the driver’s name and ID number, the name of the taxi agency he represents, the date and time of service, the destination (from point A to point B, or the distance between the two in miles), the price per mile and the total fare charged, and the passenger’s name and signature (if necessary). When Will I Need One? Some taxi operators allow hire-a-driver services where transactions record the time and date of the service rendered, along with the mileage used, and any additional costs. All these items must be reflected clearly in the receipt to offer customers a breakdown of their expenses. Passengers often refer to these receipts to know exactly what they’re paying for and why. You may also see order receipt examples. If you operate a prepaid taxi service and own a special booth at the airport or railway station, issuing an official receipt is a legal requirement that must be adhered to. Otherwise, you may not be allowed to conduct your services around the area. You may also like deposit receipt examples. Some taxi operators do offer private or personal transportation services for customers that avail for it. Here, the taxi would not function as a regular transportation network, but like a private vehicle to take you wherever you need to go for a fixed price. You may also check out medical receipt examples. The sample receipt is necessary to ensure legal and organized transactions for customers to be informed of their expenses. Anything that is reflected on the receipt but was not brought up during the agreement may be questioned by the customer. 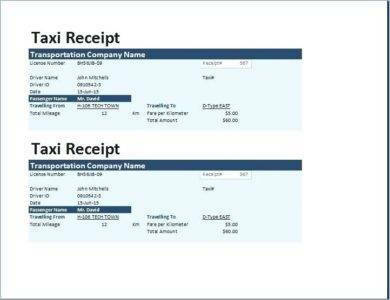 Taxi receipts are official documents essential for personal and business use. They carry vital information about the driver, the service provided, and the passenger which shall be use for tax deductions or travel reimbursements. Regardless of the type of business you are running, issuing a receipt is a vital process that should not be ignored. 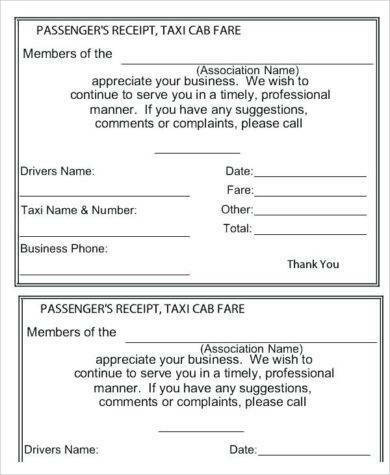 So if you find yourself in need of an official receipt, feel free to utilize these taxi receipts to fit your business purpose. 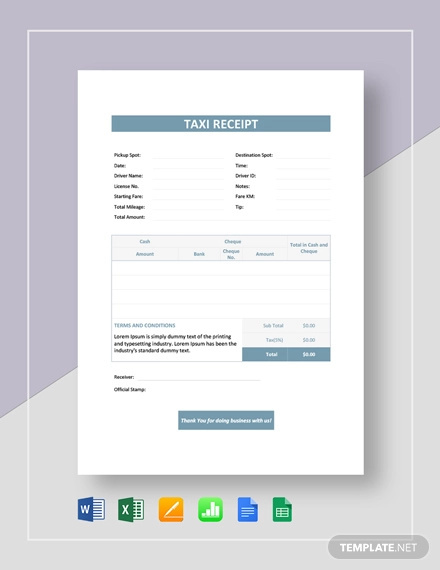 These taxi receipt templates and examples may be downloaded and customized to your own liking without a hitch!